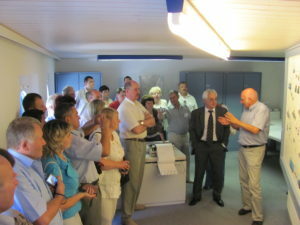 In the frame of the Decentralisation Support Project DESPRO, Skat organised and led a study tour to Switzerland with the aim to expose partners of DESPRO to Swiss expertise on efficient and effective water supply. The Ukrainian delegation included practitioners of water supply, private entrepreneurs, representatives of water cooperatives, village heads, and implementing partners of the regional and district governments. Skat prepared the study tour thematically, organised all the visits, engaged resource persons as well as managed all logistical matters. The practice-oriented study tour started with an in-depth introduction by the Institute of Federalism, Fribourg to the Swiss federal political system and the division of responsibilities as well as the legal framework for water supply and services provision in Switzerland. Visits to various water supply organisations, technical units, groundwater and lake pumping-stations and water reservoirs around Switzerland gave eye-opening insights into decentralised water supply solutions. The participants learned about different organisational models such as inter-municipal water associations, means of water catchment, treatment, calculating a water tariff, managing water bills, responsibilities of the water providers vis-à-vis the municipality and regional government. Skat organised a wrap-up workshop at the end of the study tour whereby participants could reflect on the major impressions and how they will use the lessons learned in the further project implementation of DESPRO.